Help disadvantaged families in Ecuador! Hi, my name is Whitney Fletcher. I am a junior at Middlebury and am currently studying abroad in Ferrara, Italy. As part of my abroad experience, I am doing an internship at IBO Italia, a nonprofit organization that volunteers in different countries to help people in need. I am currently helping IBO fundraise a new project that aims to help disadvantaged families in Ecuador. Diseases and illnesses plague that area and cause deaths that can easily be avoided. The solution is simple: bigger, cleaner, and sturdier homes. IBO’s project will build a house large enough to fit 20 Andean families, which will provide them with the necessary shelter to lead a healthier lifestyle. This project is also part of a larger goal, the Global Giving Challenge; if IBO raises enough money during the month of April, they will have the opportunity to become partners with Global Giving, a company aimed at helping nonprofits fundraise, and be able to utilize their resources in the future. I am really excited about this project and want to help them raise as much money as they can to help both the families in Ecuador and IBO. I am posting here to ask for your contribution and help spreading the word. Any donation, large or small, will make a difference. It is really easy to donate – all you have to do is go to the website below and click on the amount you wish to give. With your help, we can give 20 Andean families homes that they deserve and help IBO reach out to more people in need in the future. This entry was posted in community, For Students on April 29, 2013 by Whitney Fletcher. Interested in having your art work seen during Graduation and Reunion? Center Gallery at McCullough is currently looking for student art to display for its summer shows! Interested parties should contact the gallery at centergallery@middlebury.edu. This entry was posted in community, For Students and tagged art on April 5, 2013 by Stephanie Keating. MiddCORE Workshop with ?Whatif! Innovation – MARCH 1, 3-6 p.m. This entry was posted in community, For Students, Post for MiddNotes, Students on February 21, 2013 by MariAnn Osborne. Middlebury College has not received better than a “C” on endowment transparency from the College Sustainability Report Card. While the specific companies in which the endowment is invested have never been disclosed to the student body, Investure—the firm that manages Middlebury’s endowment—confirmed last spring that they do not screen for arms manufacturing, military contractors, or fossil fuel companies. Given that these are among the most profitable industries in existence, it is safe to say that they are included in our portfolio. Our complicity has on-the-ground implications: US-made weapons fueling the drug wars in Mexico, drone attacks killing civilians in Pakistan, and the Keystone XL pipeline threatening communities from Canada to the Gulf. Our choice to value monetary gain over human life epitomizes the declaration of His Holiness that “we have become slaves of money. We put too much emphasis on money, facilities, fame. There is a long history of academic institutions divesting to demonstrate their values. In the 1980s, for instance, over one hundred and fifty colleges, including Middlebury, divested from South African companies to oppose apartheid. Today, a new call to divest is being heard around the nation: last Saturday, Bill McKibben—founder of 350.org and Middlebury College Schumann Distinguished Scholar in Residence—kicked off the national “Do the Math” campaign, urging universities to divest from fossil fuels. According to the campaign, “It just doesn’t make sense for universities to invest in a system that will leave their students no livable planet to use their degrees on.” We have divested in the past; why doesn’t Middlebury embrace divesting from war and fossil fuels today? Vermont media is already stepping up to make the call (Seven Days 10/18/12: “Middlebury College Prank Turns Focus on Endowment,” VT Digger 10/18/12: “Middlebury Students Distribute Fake Press Release Claiming College Divested ‘Industries of Violence’ Investments,” and VPR News 10/18/12: “Hoax Press Release Authors Call for Middlebury Divestment”). Please join us in raising our voices together at go/compassion. AKA: Molly Stuart 15.5, Jay Saper ‘13, Jenny Marks ‘14.5, Sam Koplinka-Loehr ‘13, Amitai Ben-Abba ‘15.5, and a growing contingent. Please note: Tim Schornak is not affiliated with any formal student organization. This entry was posted in Academic, community, Dalai Lama, Middlebury Community Interest, Post for MiddNotes, recognition, Tibetan Peace Flags on October 26, 2012 by Jay Saper. 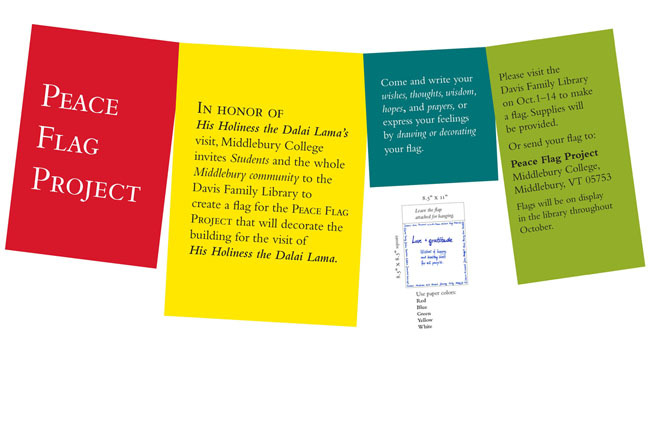 This entry was posted in community, Dalai Lama, eNewsletter, library, Library Spotlight, LIS Staff Interest, Middlebury Community Interest, Peace Flag Project, Post for MiddNotes, Post for MiddPoints, Tibetan Peace Flags on September 21, 2012 by Marlena Evans.